Many people are eager to help the environment by recycling. They might be more willing to do so if they knew some important recycling facts. Recycling is essential to green living. Resource conservation ensures that future generations will have enough of what the natural world has to offer. The Maine Department of Environmental Protection (MDEP) indicates that the demand for aluminum cans is consistently high. As such, the recycling facts related to aluminum cans are particularly important, since so many of them are used, recycled, or ultimately discarded. It's important not to underestimate the value of recycling aluminum cans. Keep America Beautiful (KAB) indicates that the recycled content of aluminum cans is 68 percent. Enough energy is saved by recycling one aluminum can to run a TV set for three hours, according to KAB. If twice as much aluminum was recycled worldwide, more than a million tons of air pollutants would be eliminated every year, according to the Univeristy of Central Oklahoma. Recycled aluminum cans are used to make fresh aluminum cans according to the MDEP because the quality of recycled aluminum is just as high. DSM indicates that aluminum cans are capable of being recycled indefinitely. Recycling tin and steel cans can conserve between 60 and 74 percent of the energy that was used to create them in the first place, according to the Environmental Protection Agency (EPA). The modern world still runs on paper to a large extent, even in the Information Age. It's important to keep in mind the implications of this paper usage, especially when it comes to recycling. Creating one ton of recycled paper uses only about 60 percent of the energy needed to make a ton of virgin paper, according to the EPA. Based on estimates from Conservatree, people can save about 24 trees by recycling one ton of office paper. The EPA indicates that it takes 900,000,000 trees to meet the needs of American paper and pulp mills. Recycling a ton of office paper can conserve 4,100 Kwh of energy, according to Stanford University. Many drinks still come in glass bottles, and many producing and disposing of so many glass bottles has a tremendous effect on the environment. DSM indicates that glass can be recycled indefinitely. According to the MDEP, recycled glass can be used to create fiberglass as well as fresh glass bottles and jars. Glass bottles left in landfills won't bio-degrade for one million years or more, according to the EPA. The EPA indicates that recycling one glass bottle can conserve enough energy to keep a 100-watt light bulb running for four hours. A lot of what people drink comes from plastic bottles. The plastic from those bottles has many uses, making it all the more wasteful when those resources are lost. Plastic bottles in landfills won't bio-degrade for 700 years, according to DSM. Recycled #1 plastic is made into polar fleece jackets, carpeting, backpacks, and insulation for sleeping bags and ski jackets, according to the MDEP. The MDEP also says that recycled #2 plastic can be made into fresh bottles, plastic lumber, and play sets in the case of plastic milk and juice bottles. Recycled #2 plastic detergent bottles can be made into frisbees, buckets, stadium seats, and containers, according to the MDEP. It's important to keep in mind that when discarded items are placed in a regular trash can, they will be used to cover landfills. 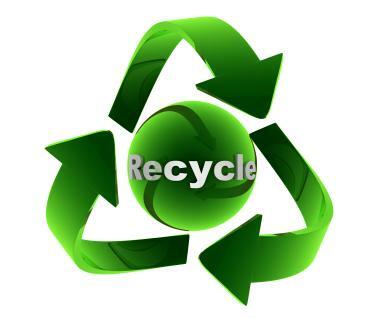 When items are placed in the recycling containers, they will be reused to make new products. The resources involved in the production of these items will still be available, which makes all the difference on a societal level.